Restaurant Kappeli was opened to the public 1867 as summer restaurant but since 1970′s it has been open all year round. Latest renowation was in autumn 2011 still keeping same traditions in building structure. In the summer you can also dine at the outside terrace, which is at the end of the building behind main terrace. If you want to sit in the middle of the main terrace but inside, ask for oriel window table for two. It is small but charming and one can even watch bands and singers at the stage opposite to the restaurant. 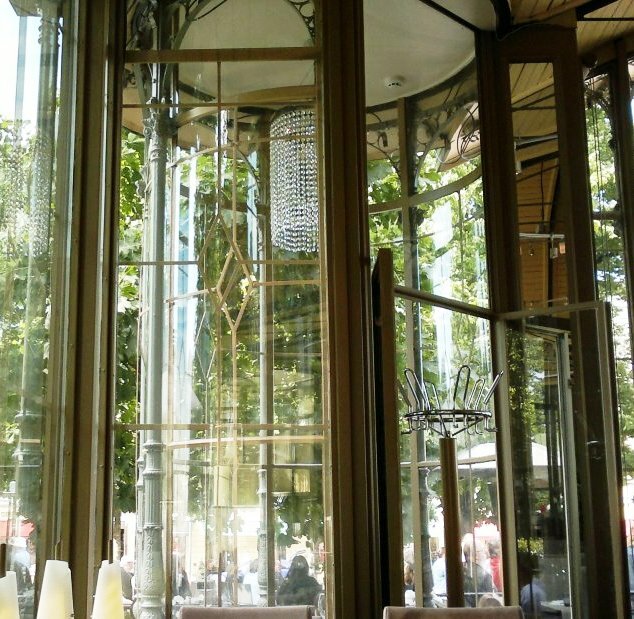 We dined in that small glass walled space on Mid-Summer Eve. Menu today looks tempting and first time it included vegan dish. 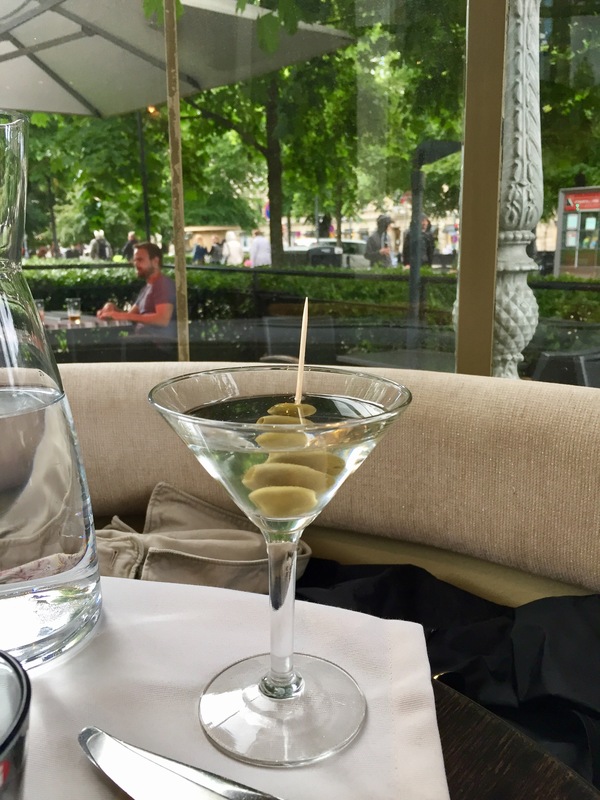 But as it was Mid-Summer, it was nice to start the dinner with Vodka Martini. Unfortunately, as drink order was taken at the same time as food orders, starter came earlier than aperitif. 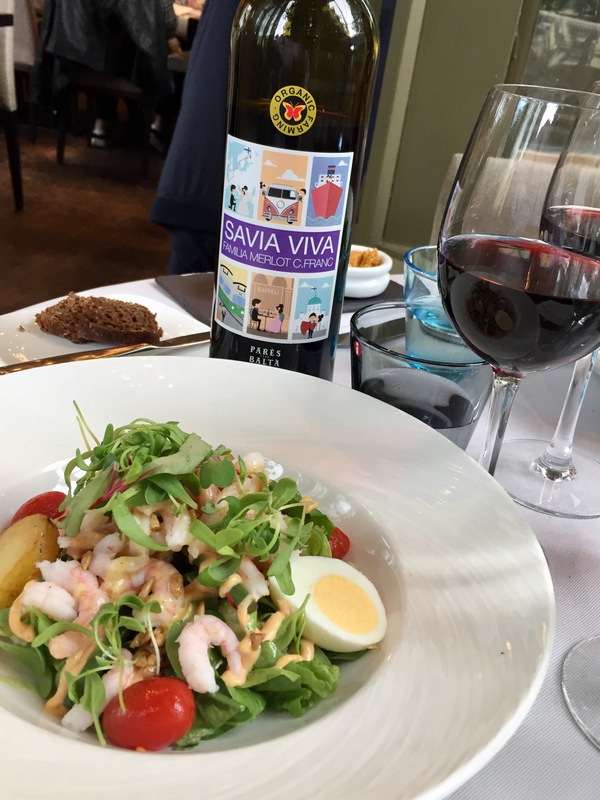 For starters ordered Kappeli’s Green salad and Prawn salad and smoky chilli dressing Citrus and tarragon marinated prawns, fried potatoes, samphire, cherry tomatoes seasoned with sorrel and egg. As green salad was so basic, no picture or story. 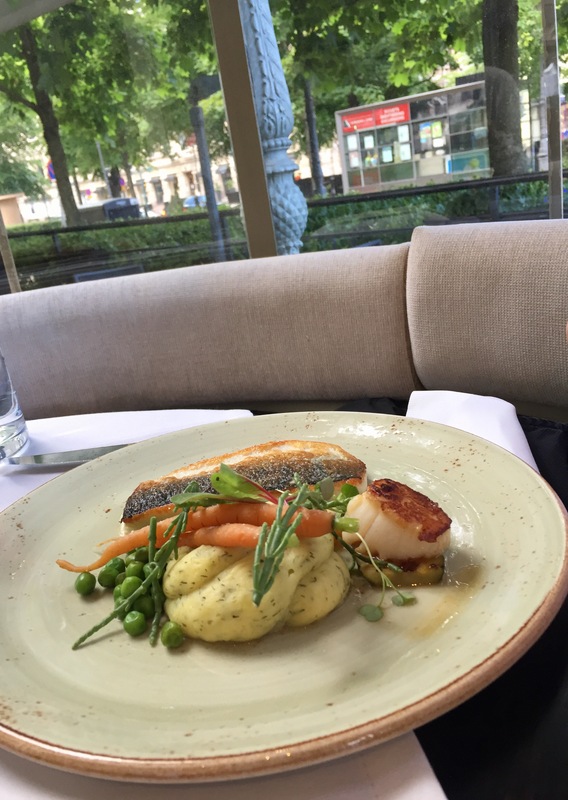 As main courses had Chargrilled whitefish, fried scallops and a fish roe and crème fraîche sauce Almond potato purée seasoned with dill, grilled spring cucumber and carrots and Broad bean and tomato ragù Deep-fried kale, fried mushrooms, macerated mini plum tomatoes and vegan cheese. Long names for portions and all ingredients well listed. Whitefish is favorite Finnish fish, light and not greasy at all like salmon. Side dishes were delicious and paired well with the main dish. Ragu was made of Finnish invention called “Härkis“. It is made from broad beans and also available in the supermarkets. Vegan dishes are not basically meant to look or taste like meat, but this one was made so well that could have thought it was minced meat like ragu usually consists of. With spaghetti would be perfect, made like that. 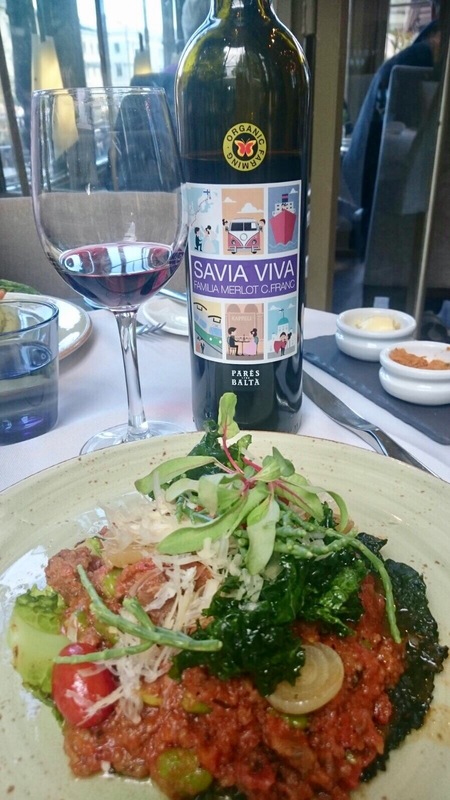 For wine had organic Savia Viva from Pares Balta. Paired well with all dishes enjoyed. Take a look at the label! You can see some historic pictures from Finland, including Kappeli. Kappeli is a perfect place to try Finnish kitchen in the center of events. Most of the diners are tourists especially now when it was Mid-Summer Eve. Food was the best one so far compared to previous visits. Especially ragu surprised. Service was polite and professional, but as mentioned earlier, aperitif was brought too late. Nice spot in Espa park. Must visit place!